We've just had the loveliest holiday! There is a little island, off the west coast of France at La Rochelle, called Ile De Re. It's beautiful. Steeped in history. Approximately 20 miles from tip to tip. We camped and, being the fair weather camping novice that I am, were delighted that the sun shone every day. The best way to get around was by bicycle; there are miles and miles of cycle paths. The island is very flat - a blessed relief for people like me wanting nothing other than to effortlessly tootle and enjoy the scenery. There are vines as far as the eye can see. We sampled a number of delicious wines that the island produces ... naturally! Hollyhocks grow absolutely everywhere. From solitary stems in pavement cracks to abundant bushes. These Dublin Bay prawns were delicious. I also nibbled away at the seaweed garnish which was surprisingly delightful. Sort of like a meaty lettuce. Until the waitress said "ooohhh, algae, non, non, non!" Yikes! I spent the next day or so thinking it might be my last! I love the IDEA of oysters. In reality, no thanks. Sea snot. No technology. No make-up or hair straighteners. No routine. No obligations. Just me and my little family and nature's playground. A joy. 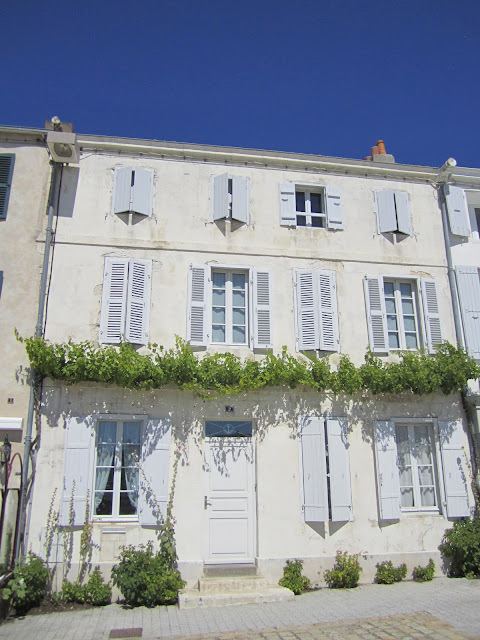 Edited to add : I've just been reading up about Ile De Re and it would appear that Johnny Depp has been known to holiday there. Damn. Had I known, I would have kept my eyes peeled! It looks beautiful,glad you have a wonderful holiday. You havnt been on here for ages,I wondered what you were up to. Looks beautiful, glad you had such a good time. Love your buttony flipflops. Haha, sea snot! My sentiments exactly! Looks like you had a lovely holiday . Looks like a fantastic place - I'll bookmark that one for another time. I also rather fancy camping too but, like you, think the weather needs to be glorious!! 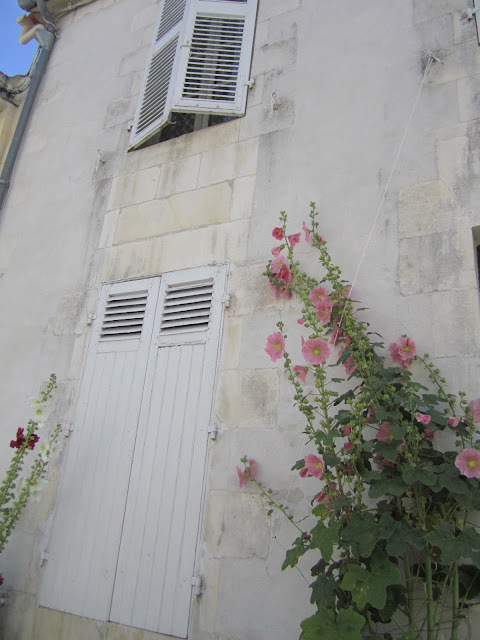 We've just got back from France too and, as on your island, there were hollyhocks everywhere. They were beautiful! Literally growing through cracks in the pavement too - I'm now thinking that I can scatter a million seeds around the edge of our house and have a similar effect next year. What do you reckon? Nice to have you blogging again - yours is one of my all-time favourites. 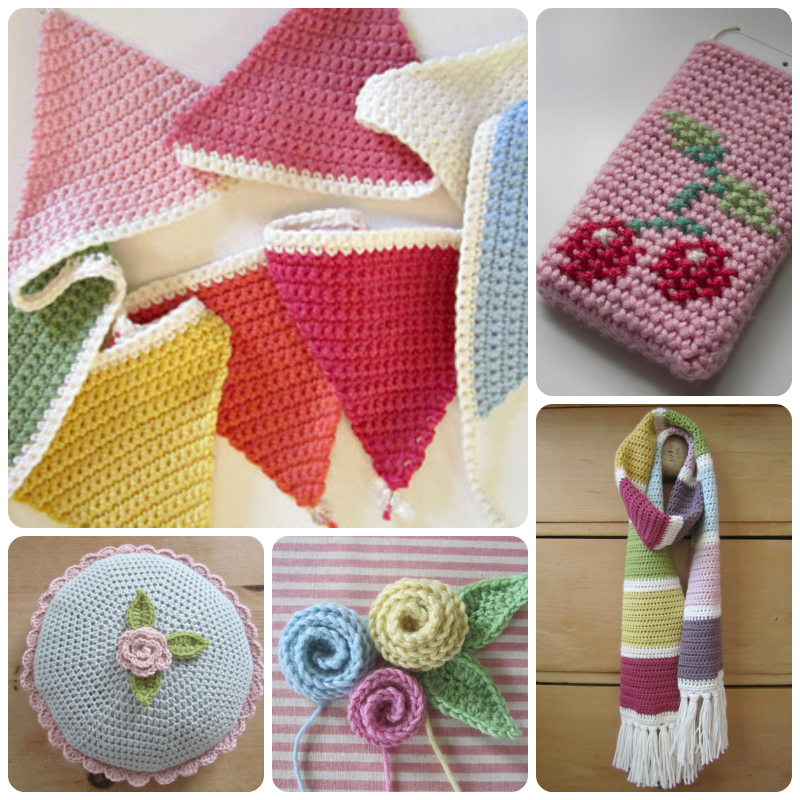 Hello Heather, lovely to hear from you again! Lovely pictures, they just capture summer completely ... glad you had a lovely time. PS Where are your flip flops from, they're gorgeous! Wow! sounds perfect and nice flip flops! Colour me green! What a glorious place!! Ahhhh welcome back. I am not on Instagram as have the OLDEST phone known to humanity. I see OAPs with fancier phones!! Really good to read your news and your holiday sounds gorgeous. I tried an oyster in France last year and actually it wasn't as sea snot-like as I thought it would be. Think I am glad I tried one, but can't see the point of it. Oh I have NO class!!! Your flip flops are gorgeous, where did you get them? How gorgeous this place looks. I have planted a heap of hollyhocks. I doubt they'll come up. the others never did! So lovely to have you back sea snot girl! I was turned off oysters years ago when a friend of mine compared his bronchitis coughing to lung oysters; HORRID! I'm so glad you had a great time: those pictures smack of my husband's territory - southern Brittany - where thankfully we'll be off to next week. 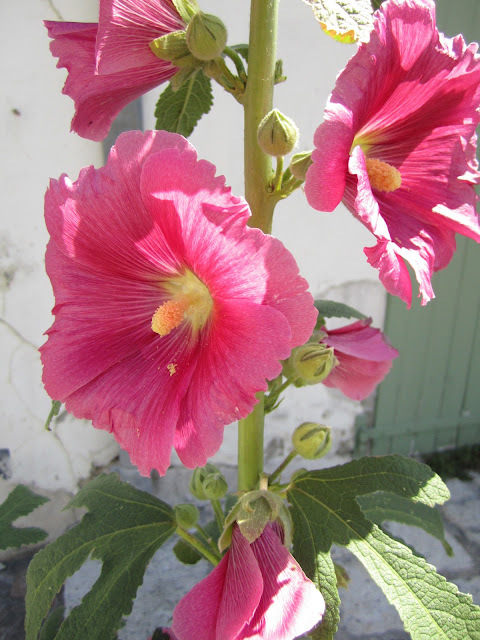 There are hollyhocks growing everywhere here too! I've got a feeling that Hugh Fearnley-Whittingstall's wife is from the Ile de Ré -not quite as thrilling as Johnny Depp I know. That seafood looks gorgeous and I love the buttony flipflops. What a pretty place, I've never heard of it. I really enjoyed your photos - sunshine & Johnny Depp? What could be better?! Gorgeous photographs Heather! Glad you had a lovely holiday. Such gorgeous photographs! What a beautiful place, it looks like a wonderful holiday. 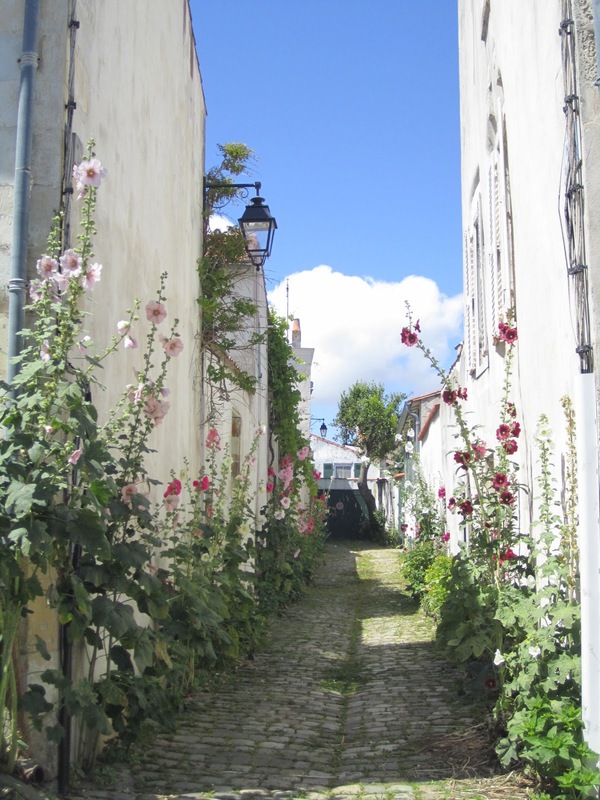 I have seen hollyhocks growing along little streets in other parts of France, and I just love those pictures! Enjoy the rest of your summer, Heather. Those pictures, gorgeous. It's like I'm on holiday in my living room... only with less hollyhocks, no sun, loads of toys and no amazingly mouthwatering seafood - yeah so not at all really. Oh that looks a wonderful place, my hollyhocks are nowhere near as good as those. If I wasn't keen on oysters, I certainly am not now after reading Millefeuilles comment LOL. I'm new to reading your blog so it's nice to meet you. Oh Heather, it looks like you had a wonderful relaxing sunny holiday! 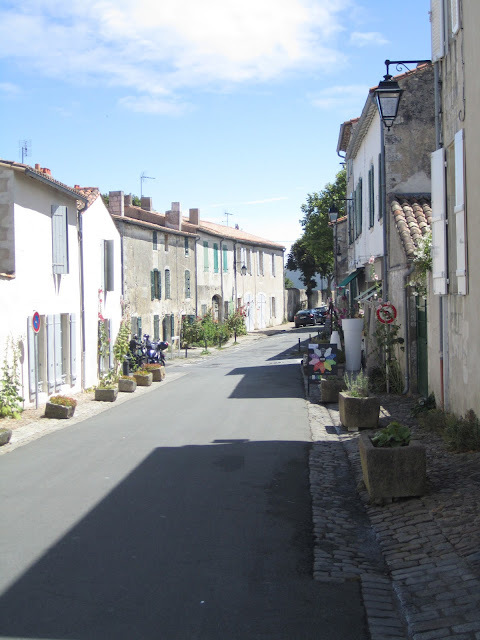 Have had many happy holidays in France but have never been there - it does sound lovely. The hollyhocks look so pretty against the painted walls of the houses. Hope you enjoyed the rest of your summer hols despite the naff English weather - but its been good the last week or so!